Whilst some walkers live for the latest hiking gear and gadgets, for us our trips are more about the feeling of freedom and being reliant on ourselves to survive. Any kit we take with us is secondary and so we wouldn't normally be found checking out technology. 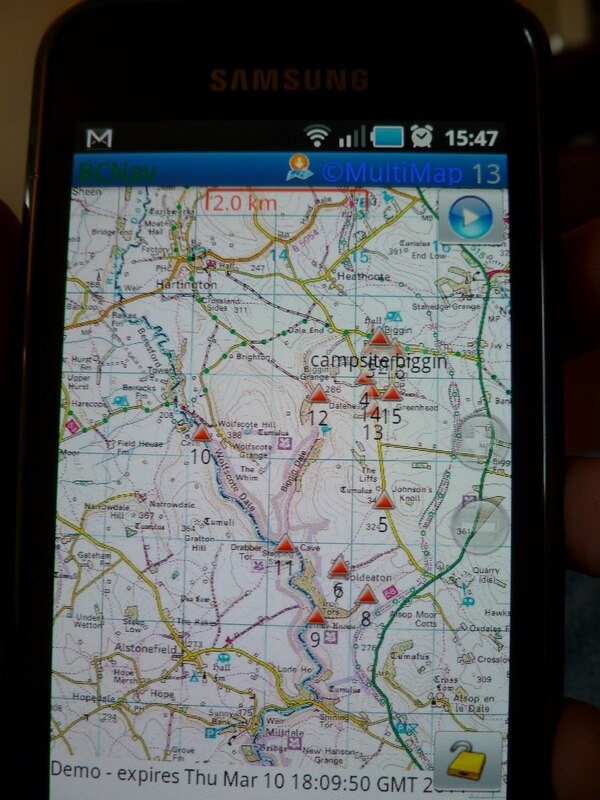 However when we made a rookie mistake and took the wrong map with us to Biggin Dale, we tested out the BackCountry Navigator Android app on the Samsung Galaxy S.
BackCountry Navigator is an mapping software app for your mobile phone that allows you to navigate outdoors using your gps signal. It gives you access to UK Ordnance Survey (O.S) maps allowing you to zoom in and out depending on the level of detail you need to see. For non-UK users or for hiking trips abroad, it also gives you access to topo maps in the US, Canada and parts of Europe. BackCountry Navigator is available as a free trial version and also as a pro edition for unlimited use for just £6.20. Unlike other mapping software such as Mapyx, you don't need to buy the maps, once you've downloaded the app all maps are free to use. When you first open it up, you get some quick tips to help you get started. There is also an online help button where you can go to learn more. Even though I work in the mobile phone industry I'm not very tech savvy so it was great having some step by step instructions! Once you've chosen the type of map you want, you then search for a place to get you started. You can opt to download a number of squares from the map for use later so that you don't need to have cell phone signal to use the map. If you have wi-fi at home, you can download your map for free before you leave so you don't need to use your mobile phone data allowance. BackCountry Navigator lets you mark waypoints along your route which you can then navigate to. The trip computer view will show you the distance to the waypoint from your location and the bearing you need to walk. You can use the GPS and watch the arrow move along your route as you walk. There is also a compass view. But as any Smartphone users will know, strain on the battery means that you are constantly needing to charge them. The developers of BackCountry Navigator have thought of this so rather than having the GPS on permanently, you get the option to switch it on and off as you need to conserve battery power. We've not tested it out on an extended hike yet but a blog on their site gives you some further tips on how to prevent battery drain and makes some impressive claims. As yet I've not found a way to view the length of your planned walk or ascent over the course of the walk. This would allow us to use it to plan a walk in the same way we would with Mapyx or Memory Map. That said, it pitches itself as a navigational tool rather than a route planning tool and is cheaper than the other software. I did manage to crash it but I think that was more of a problem with the user than the software – when will I learn that pushing too many buttons all at once doesn't help?! Overall, we thought it was a great app and recommend you check out the trial version for yourselves. Next time we'll be trying to remember the correct map but will certainly be checking in with BackCountry Navigator if ever we're not sure of the route. It will also be useful for exploring new areas before we decide whether to buy the O.S. Map. Hi Cat, thanks for the post. I really like this software, stable, easy to use and does exactly what it says on the tin. Good stuff. All I need now is a solar charger on the back of my pack, and a real map and compass of course. Yes a real map and compass is always a good idea! We'll make sure we get the basics right on our next trip. We've often thought of getting a solar charger too. Definitely a good investment for a multi day hike. Plus, I did have an addiction Angry Birds for a while...something to do when it gets dark at 5pm! Has Backcountry Navigator or Critter Maps got a license From OS to use 50 k& 25k ? I cant find any reference.